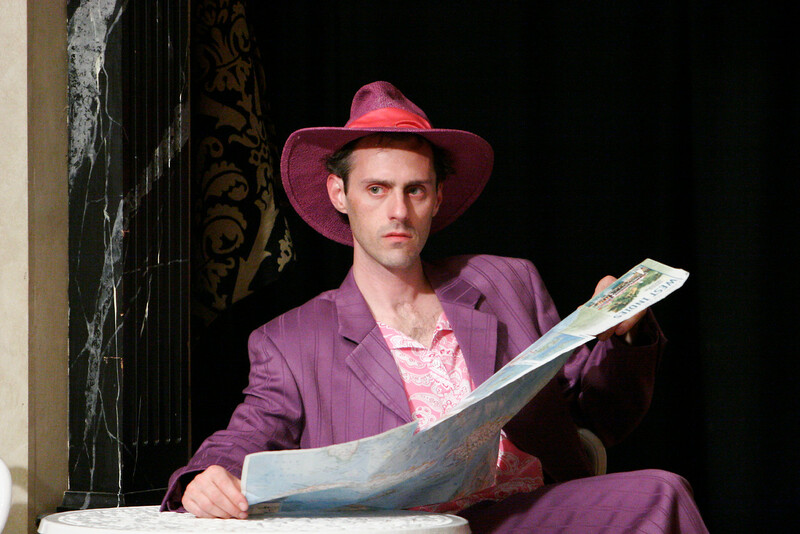 John Paul Scheidler in THE COMEDY OF ERRORS. Photo by TOMMY THOMPSON. 2005. 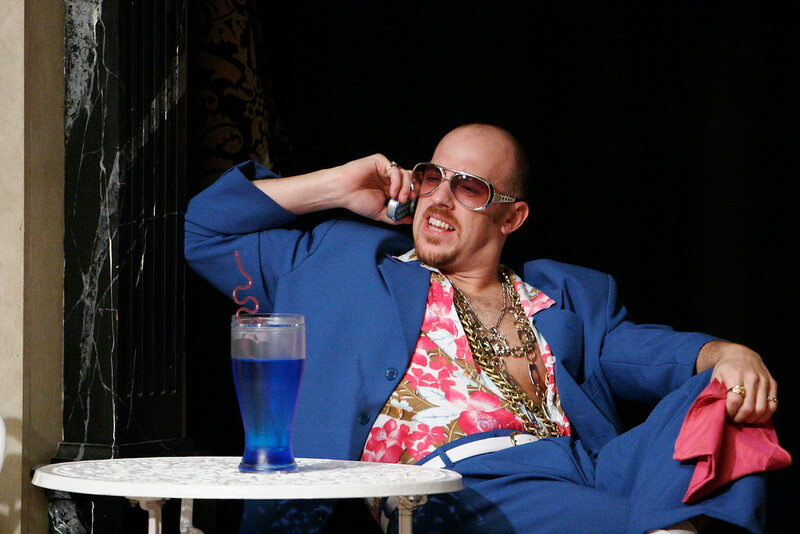 Bernard Bygott and Khris Lewin in THE COMEDY OF ERRORS. Photo by TOMMY THOMPSON. 2005. 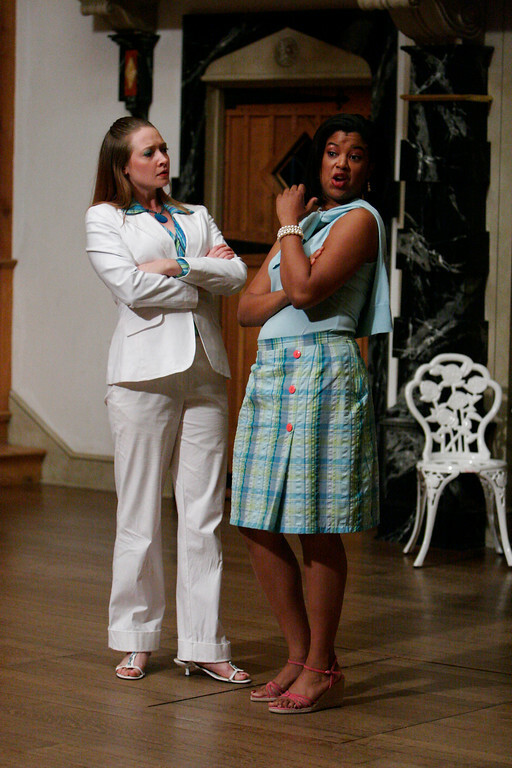 Sarah Fallon and Amy-Kristina Herbert in THE COMEDY OF ERRORS. Photo by TOMMY THOMPSON. 2005. James Beneduce in THE COMEDY OF ERRORS. Photo by TOMMY THOMPSON. 2005. Khris Lewin and Sarah Fallon in THE COMEDY OF ERRORS. Photo by TOMMY THOMPSON. 2005. 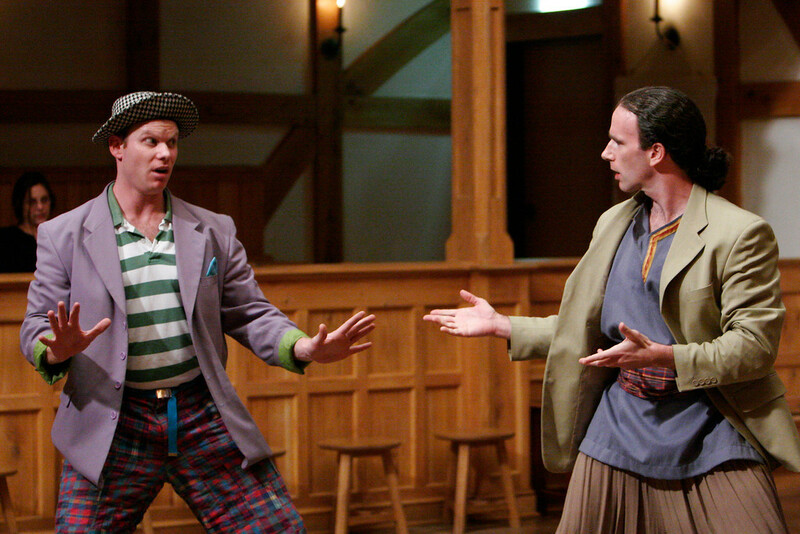 John Paul Scheidler and James Keegan in THE COMEDY OF ERRORS. Photo by TOMMY THOMPSON. 2005. 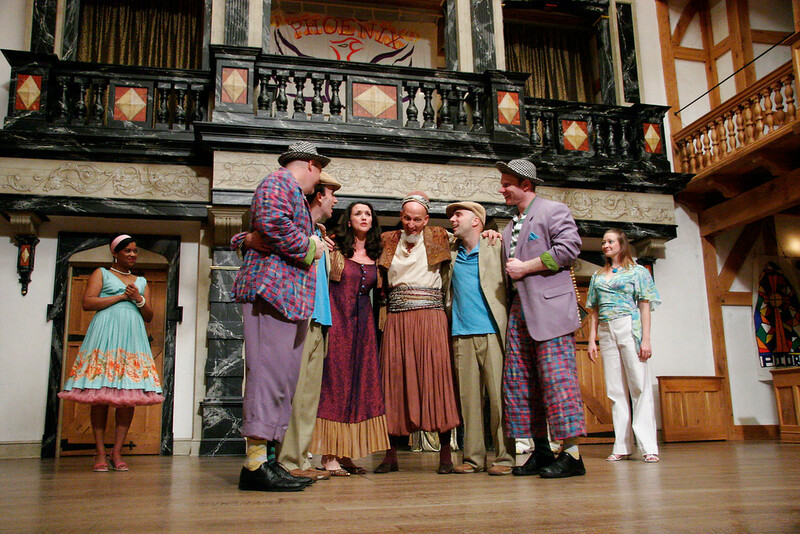 The cast of THE COMEDY OF ERRORS. Photo by TOMMY THOMPSON. 2005. 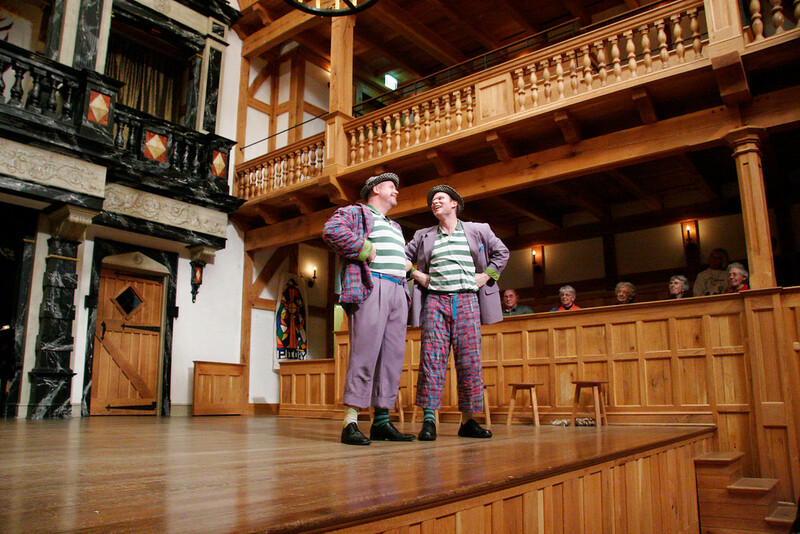 James Keegan and Bernard Bygott in THE COMEDY OF ERRORS. Photo by TOMMY THOMPSON. 2005. Because of a feud between the cities of Ephesus and Syracuse, Egeon (a merchant from Syracuse) is apprehended in Ephesus and condemned to death by Duke Solinus. Twenty-five years earlier, he and his wife, Emelia, had twin sons (both named Antipholus) who were attended by twin servants (both named Dromio). On a sea voyage, a storm separated Egeon, one son, and one servant from Egeon’s wife, the other son, and the other servant. Eighteen years later, Egeon’s son left Syracuse with his servant to search for his lost brother. When his son did not return, Egeon left Syracuse to search for Antipholus but wandered for years before being arrested by Duke Solinus in Ephesus. The Duke grants Egeon one day to secure a ransom. Unaware of his father’s situation or location, Antipholus of Syracuse and his servant Dromio arrive in Ephesus. Antipholus of Syracus is also unaware that his brother lives in Ephesus with his wife Adriana, her sister Luciana, and his lifelong servant named Dromio. Antipholus of Syracuse sends his Dromio to secure their lodging. Adriana sends Dromio of Ephesus to fetch her husband home to dinner. Confusions, beatings, and errors ensue. I send you warm greetings from Louisville, Kentucky. I am delighted you have joined us for our production of The Comedy of Errors. 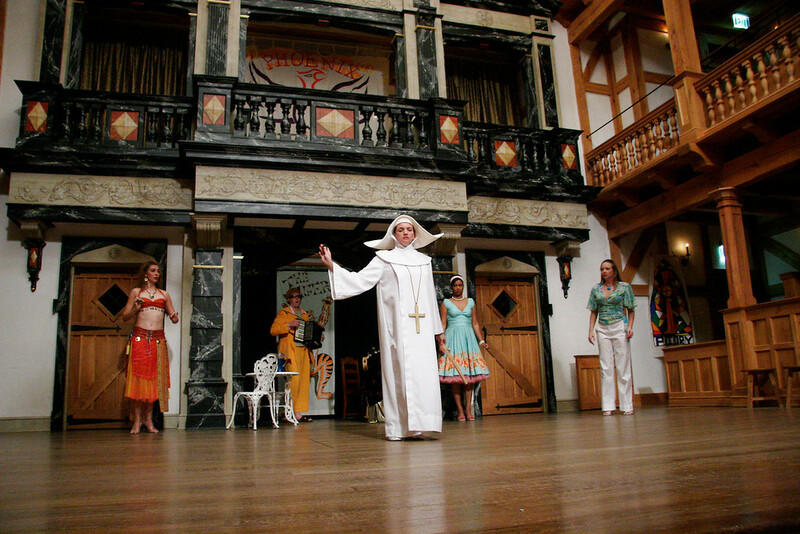 I knew I wanted to direct a play on the Blackfriars Playhouse stage the moment I saw it when I attended the 2004 Shakespeare Theatre Association of America (STAA) annual conference hosted by Shenandoah Shakespeare. During the day, the conference meetings were held at the Blackfriars and in the evening, four productions were presented. A working life in the professional theatre is about connections; I am fortunate to have a variety of connections with Shenandoah Shakespeare’s American Shakespeare Center (ASC). My connections include: Artistic Director Jim Warren from the annual audition circuit we both attend; Executive Director Ralph Alan Cohen and Associate Artistic Director Joyce Peifer from STAA conferences; alumni actors Marni Penning (and fellow Ralph Cohen former-student Jason Minadakas) from the Cincinnati Shakespeare Festival, Craig Wallace from hiring him as an acting intern in Kentucky Shakespeare Festival’s 1990 summer season, Joe Falocco from hiring him to play Dromio in a 1994 production of Errors at KSF; current actor René Thornton from auditioning him when he was an undergraduate student of my friend Ken Washington at the University of Utah; and M.Litt graduate Nancy Beall from her internship with Shakespeare Behind Bars. 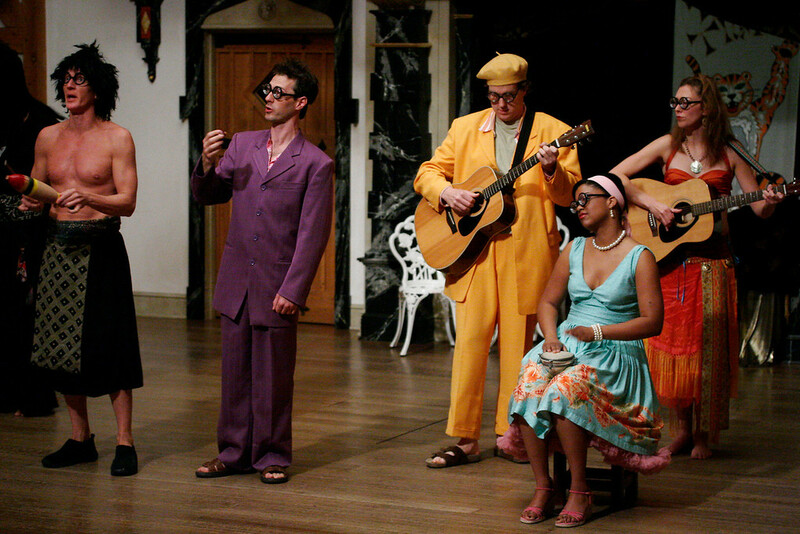 I am honored to have been given the opportunity to assist in the preparation of our production of The Comedy of Errors for the 2005 Summer/Fall Season of the ASC’s Blackfriars Playhouse. I count myself fortunate to have spent my professional life as a player doing plays in a playhouse. What a treat it was to spend three weeks in Staunton, Virginia playing on the magnificent Blackfriars Playhouse stage. I had an invigorating creative experience working collaboratively with the Blackfriars Playhouse’s talented Resident Troupe and our superb costume designer Erin West. The only honest art form is laughter, comedy. Lenny Bruce. William Shakespeare never tired of looking at life in all its infinite variety. What emerges from his 17 comedies is an all-embracing vision of life that includes the endless diversity of human experience. Coleridge pronounced Errors “remarkable as being the only specimen of poetical farce in our language.” Mistaken identity, love, jealousy, impatience, and reunion combine to make Errors a hilarious evening of rollicking, side-splitting, outrageous fun, and knockabout, farcical, high jinx. Being a farce, Errors contains a large number of improbable situations. To our modern, realistic minds, these improbabilities will seem absurd…witless…ridiculous. In fact, you may well find yourself thinking, “That just doesn’t make any sense. Why can’t those characters see what’s happening?” The joy of farce is that it’s okay for situations not to make one bit of realistic sense. In fact, in farce, confusion is a requirement. Be assured, the disorder will again be restored but not before some silly, goofy, foolish, senseless, and outrageous events have transpired. William Shakespeare wouldn’t be William Shakespeare if he didn’t dig deeper than the farcical events that transpire. Errors functions as a romantic comedy as much as any romantic comedy Shakespeare wrote. The principal characters in the play are involved with the serious issues of love (both old & new), fidelity, jealousy, truth, personal honor, and reunion. For maximum enjoyment, we have a simple request of you. Set aside your logical left brain, suspend your disbelief, return to your childhood mind, bring your imagination, and enter the fantastical world of Errors. Surrendering to this request will allow you to revel in the sheer lunacy of this delightful farce. Thank you for joining us. I hope you have as much fun viewing our production as we had preparing it for you. Please return often to the Blackfriars Playhouse and bring your family, friends, colleagues, and neighbors.